The Noble F. Dunshee Block is one of the oldest and most architecturally significant buildings in the downtown area. It provides an excellent example of Italianate Revival style type architecture which found its way to Vermont following the Civil War. 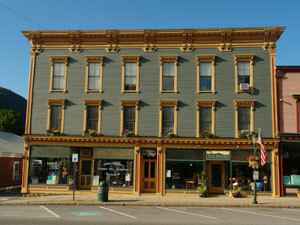 The building was built in approximately 1870, and includes richly ornamental cornices at the roofline, window heads, and over the store fronts. These, along with the wood trimmed clapboard façade, provide a strong, horizontal emphasis, and a style which was usually achieved only with cast or stamped metal. 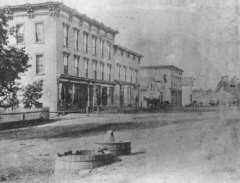 When the building was originally built, it housed two shops on the ground floor, a meeting hall on the second floor, and apartments on the third. Extensive renovations upgrading the apartments were done in 1985, and again in 2000. 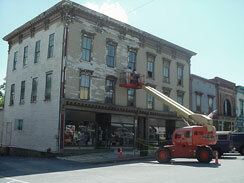 In recent years, Wells Mountain, LLC sought to further enhance the appearance of the building through exterior painting that provides maximum emphasis of the unique architectural features. Over the years, commercial businesses that have been in this space include Dunshee’s Clothing Store, W.R. Brook’s Clothing Store, Way’s General Store, Moynihan’s, Peggy’s Beauty Shop, Joni’s Clothing Store, Pete Hanson’s Plumbing Supply, Bristol Electronics, Barry O’s, Forest & Brooks, Adam’s Upholstery, Unpainted Furniture, Show Time Video, and Bristol Cliffs Music Center. Present tenants include Kimball’s Office Services and Verde Mountain. In 2011, the first apartment was converted to the Pocock Suite, and Bristol Suites was born. Since then, the four apartments on the second and third floors and the two offices on the first floor have been converted to rooms and suites as Bristol Suites grew to its present size. Bristol Suites offers six rooms and suites, four with fully-furnished kitchens for extended stays or shorter stays with a three night minimum. The Dunshee Block has two stores on Main Street, measuring 1100 square feet and 900 Square feet respectively. Both also have basement storage and access to the rear of the building.